Blue Ridge Energy urges members to keep important safety tips in mind, ahead of this weekend’s winter storm. Forecasts continue to indicate that a large winter storm will impact the Blue Ridge Energy service area. Preliminary snowfall projections suggest that many portions of the service area may be impacted by over one foot of heavy wet snow. 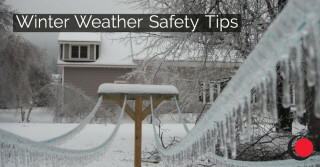 Wet snow weighs heavily on tree limbs, possibly leading to trees or limbs falling on power lines. • Only operate generators in an outdoor area, no less than 15 feet from any building. Adjust your generator so that exhaust fumes are pointed in a direction away from your home. • DO NOT attempt to wire a portable generator to your home’s electrical supply. Wiring should be handled by a licensed electrician. If wired improperly, it can have deadly consequences for line technicians and yourself, due to energy back feeding to lines. • Keep refrigerator and freezer doors closed as long as possible. Use practices such as grouping food together, keeping frozen ice packs inside and having coolers on hand. • Gather supplies in case you need to stay home for several days without power. Keep in mind each person’s specific needs, including medication. For winter storms, keep bottled water, non-perishable foods, extra blankets and warm clothing on hand. Do not forget the needs of pets. Have extra batteries for radios and flashlights. • Avoid travel on snow covered or icy roads. As a reminder, if you see crews working alongside the road, you are required by law to switch lanes or slow down considerably.